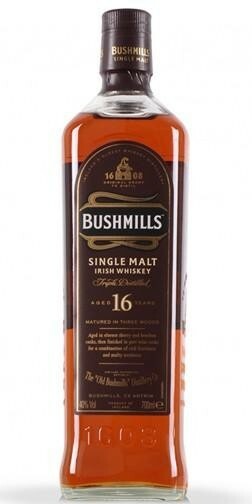 Bushmills Malt 16 Year Old is a rare single malt Irish whiskey. With Three Wood maturation and finishing, a malt of distinction emerges, with a fullness of depth and flavor rarely found. This exceptional whiskey is matured for 16 years or more in a combination of American bourbon barrels and Spanish Oloroso sherry butts. The bourbon barrels infuse delicate honey, mild toasted wood and vanilla notes, while the sherry wood lends the malt a rich, fruity sweetness and a distinct nutty character. These whiskeys are then vatted together and married for several months in large old port pipes. This imparts a subtle finishing touch of sweet wine, and allows all flavor elements to gently mellow together, giving Bushmills Malt 16 Year Old its depth, balance and complexity.